What does Brexit mean for Scottish Startups? Brexit is bad news for Scottish startups – but I hope and believe it is the sort of bad news that will make things just a little bit harder rather than the sort of bad news that should have us running for the hills. Uncertainty will impact both customers and investors in the UK, and potentially costly changes to regulation and grants will be unwelcome. London investors in particular will take time to recover from the news, and investment from London could all but dry up in the event of a serious threat of Scottish independence. Highly differentiated products like those from startups will most likely continue to be competitive in Europe whatever our relationship with the EU, but tariffs and customs complexity will add friction to trade. Reduced movement of people could reduce access to skilled workers, but also help keep homegrown talent here. The situation could deteriorate rapidly. If negotiations for Brexit become rancorous, or if Scotland were to leave the UK, there would almost certainly be a huge short-term shock that would make life difficult for both investment and sales. Confidence in both the consumer and business world will be vital – if confidence falls and recession follows we could all be in a difficult position. No-one actually knows what Brexit is – or rather, where we are heading. There is still a tiny possibility it may never happen. We may end up part of the EEA – with relatively little change. We could end up in a hugely acrimonious exit, with punitive tariffs on trade and rules on migration – or even travel. We just don’t know. In Scotland we have even more variables – the additional uncertainty of a potential second independence referendum and all the further variables that introduces. Scotland outside the UK but in the EU? Using the Euro? In Shengen? What will our new relationship be with rUK? Will a Scotland/UK divorce be friendly or acrimonious? What will the settlement be on border control, trade, debt… We could, like Ireland, become a English-speaking, friendly gateway to the EU for the rest of the world – potentially an economic powerhouse. Or we could be a mostly forgotten backwater, despised by rUK for leaving and mistrusted by the EU for our UK past. All of this uncertainty is unequivocally bad for business and investment. It is a distraction for everyone. In terms of angel investment, I don’t yet see any changes in Scotland from the people I have spoken to in the last few days. I’m seeing signs that investors from London, are drawing back from opportunities because of the Brexit vote. At the moment we’re at the “let’s postpone this” stage, but they have already mentioned that they don’t know how Brexit will impact their personal wealth and thus ability to invest. I also know a growth stage fund manager who is worried that the European investors who are the mainstay of this fund will pull out of the raise for the next one – halting new investment. I am optimistic that some of this is simply a “shock” reaction, and that things will settle down a little, but with continuing uncertainty around party leaderships, the next prime minister, and the shape and timing of a deal, I worry that investment will still slow overall. Worries about Scottish independence may also limit investment from rUK into Scotland – I’m not seeing this yet but if it became likely that Scotland was going to become independent and join the Euro I would expect it to become a much less attractive destination for London investors. Much as dislike of globalisation may have been one driver for Brexit (see Lord Ashcroft Polls) , the fact that money and markets are global will most likely be a cushion for startups. Most B2B and many B2C startups have global markets from day one. Undoubtedly some UK customers will be distracted from regular business by Brexit which may reduce opportunities, but globally I don’t see Brexit changing things. One company I work with trades globally and has already had new orders from the far east since the vote – Brexit seems irrelevant to these deals. For B2C startups relying on local customers, the combination of uncertainty and potential recession may well mean people are spending less money, and it is harder to win customers. If confidence remains high, there will be less impact. For many international businesses the weaker pound may represent an opportunity to either price more aggressively to gain market share, or to increase margins. Labour costs in the UK are down, relatively speaking. I work with a manufacturing company that imports most of its parts (cost are rising due to weak pound) but exports products (income in Euros and Dollars is worth relatively more) so overall it should be a win. This company already deals with USA and Asia and their local tariffs, standards and currencies. Where companies have strongly differentiated products or offerings that are globally competitive already, Brexit should make little difference. This will be a potential area of change. Some grants obviously come from Europe, for example through Horizon 2020, and it remains to be seen if these will be replaced at UK or Scottish level. Freed from the EU, the de minimus rules that limit a company to €200k grants and SEIS investment could be scrapped or limitations reduced, which would be very welcome. About 5% of Scottish Enterprise budget (about £11m in 2015) comes from the EU, the rest from Scottish Government. Some of the Scottis Government contribution may also have come from the EU indirectly. 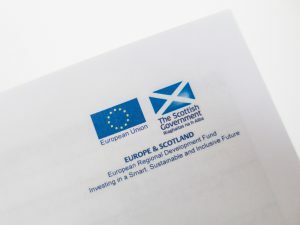 SMART Scotland is a fabulous grant scheme (not least because it is outside de minimus) but some of that money comes from Europe (ERDF) too – although that may be included in the previous figure I gave for SE – it’s hard to tell from public data. The West of Scotland and East of Scotland Loan Funds have European money at the moment too, as I think does Scottish Investment Bank. The public sector funding regime has been relatively stable for many years now – and could remain so if the UK or Scottish Government choose to replace European money with local money. This could also be an opportunity for a big shake up to improve things further. It’s just too early to say. Regulation is costly, but changing regulation is even more costly. If the UK starts to diverge from EU regulation then the change will be costly and most international companies will still have to follow EU regulations too (at least on standards – perhaps not on workers rights) in order to trade. There doesn’t seem to be an up-side here, but hopefully change will take place over a long enough period to have limited impact on startups. In many sectors recruitment is challenging at the moment due to a shortage of good candidates. Losing easy access to European talent could exacerbate this situation, making startup recruitment even harder. However, we also export a lot of talent to London and Europe – and the same controls that would make it harder to bring people in would also make it harder for people to leave. Reduced investment in big companies (banks and financial institutions) could also reduce competition for the best people. So this too could cut either way.